A man in Kenya found his dog had ate eaten his rent money. To get even, he brought his dog to the police station and ordered the police to arrest his dog. When they wouldn't do it, he offered them a "fee" to get them to lock the dog up. The officers put the dog in jail and ended up getting fired for taking a bribe as a result. The dog was returned to his owner who now is trying to sell the pup and trying to figure out how to pay rent. 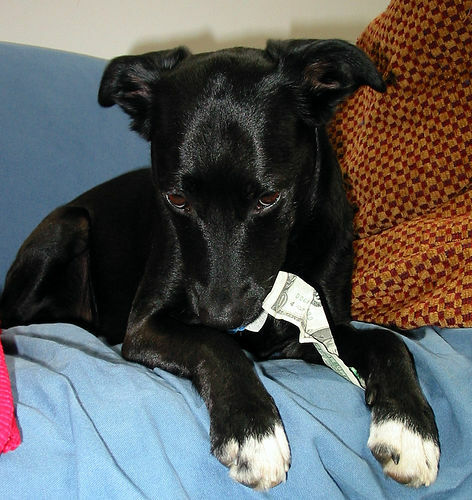 I'm somehow doubting the landlord will buy the old "my dog ate my rent money" story. What a great story... I can believe it as our puppy (now 3) just chewed a 20 in half. But all your rent money... I'd be checking the exit stuff for that much money. The puppy is cute cute cute! That is one cute dog. How about I adopt him and the guy can use the adoption fee to pay his rent? Sounds like a win-win situation. "had ate"? Should be "had eaten".